New York, New York. What a fun weekend we had! 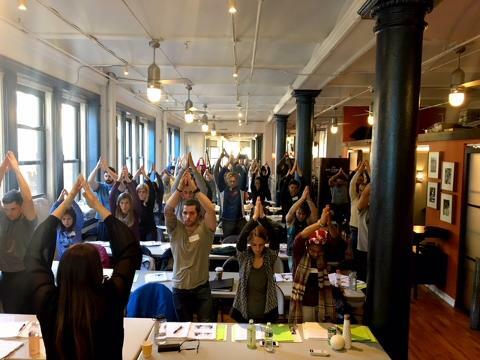 James and I had the opportunity to hang out with some accomplished and energetic professionals this past weekend in downtown Manhattan as we taught the PRI Integration for Fitness and Movement Course for the first time in 2018. Thank you so much to PRC Alicia Ferriere, Michael Conlon, and the Finish Line staff for hosting and welcoming us into their beautiful and innovative clinic. Great place to go to for PT and recovery in NYC! James and I were able to launch some of the new material and get fitness and movement professionals exposed to how to optimize three dimensional core activation and train the abdominals to enhance ventilation mechanics and trunk stability. 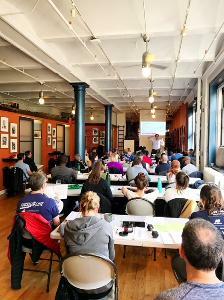 The course attendees were well mixed with seasoned PRI enthusiasts looking for fresh insight and ideas to enhance their integration of progressing pelvic-thoracic relationships, as well as new inquisitive minds looking to understand what the PRI science is all about. The mix in attendees gives us a chance to unite and learn from one another as this course is not a course which focuses on pathomechanics and pathology but instead talks about key biomechanical principles involved to preserve postural relationships, functional symmetry, spine health and rotational control, as well as emphasize how to better organize and prime muscle groups to promote single leg control and power for gait. I love how the course continues to grow, evolve, and progress the utilization of PRI and helps us all appreciate the natural delicacies of our complex biomechanical machine. I’m excited for all the cool places we get to travel to this year to share this material – St. Louis - Salem – Burlington, VT - Charlotte, NC - Los Angeles – Chicago - and Philadelphia.